The Pacsafe Intasafe Laptop Briefcase takes things a step further with its 15in tablet compatible sleeve, internal & external organisation and 6 anti-theft features including the new Roobar™ Deluxe Locking System. The Roobar™ Deluxe Locking System allows you to clip and secure all your zippered compartments to one point, and lock zippers down with a padlock for extra security when needed. It offers eXomesh® Slashguard which protects your gear from a quick slash-and-run theft. This urban briefcase comes with smart zipper security tab that deters pickpockets by keeping zip pullers under a secure tab. 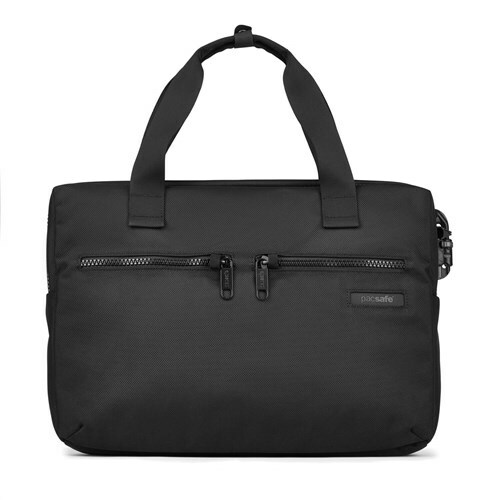 This spacious briefcase fits a 15-inch laptop, phone, passport and more, with organization to keep everything sorted. The two side pockets can be used to keep water bottle or accessories handy. 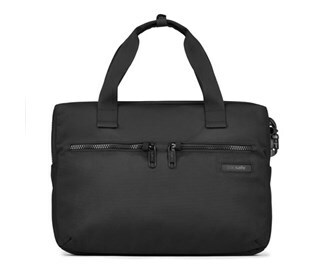 The Intasafe slim briefcase is perfect for on-the-go urban professionals. The Pacsafe Intasafe Slim Brief - Black has many exciting features for users of all types. See the Pacsafe Intasafe Slim Brief - Black gallery images above for more product views. The Pacsafe Intasafe Slim Brief - Black is sold as a Brand New Unopened Item.